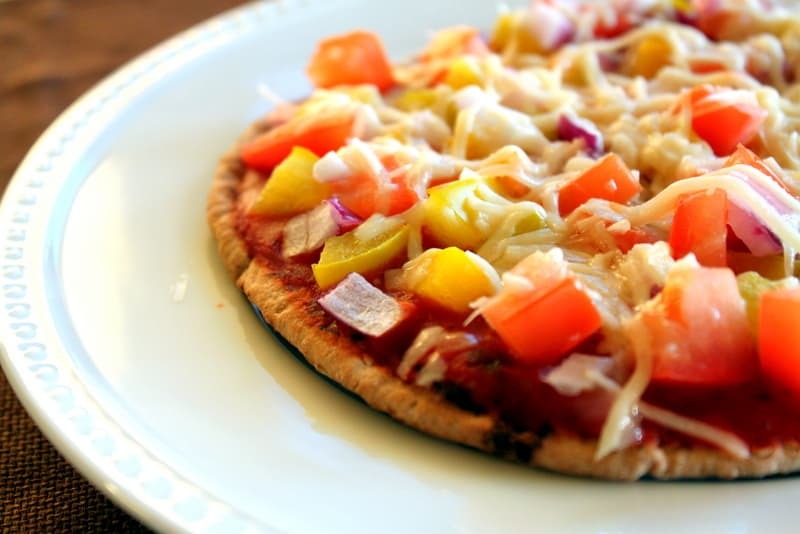 Pita Pizzas are a go-to meal in our house, pretty much every week. 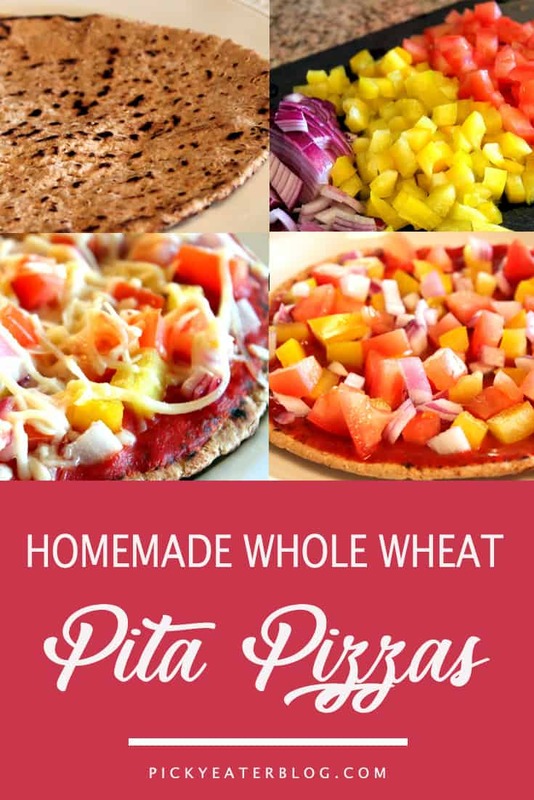 I remember when I first suggested the idea of pita pizzas to my husband. It was a couple years ago, and we wanted to make pizza but didn’t have any dough. I suggested using pita bread for the dough, and he looked at me like I was crazy. “ok… but I’m skeptical,” he said. I remembered loving pita pizzas as a kid, and so I figured there was no way he wouldn’t like it as well. 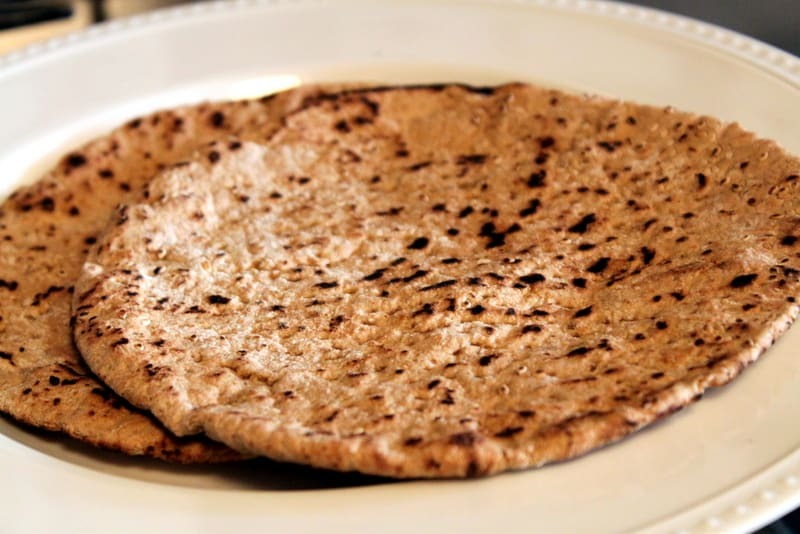 There’s something about a whole wheat pita that just gives such a great texture and hearty flavor to the pizza crust. 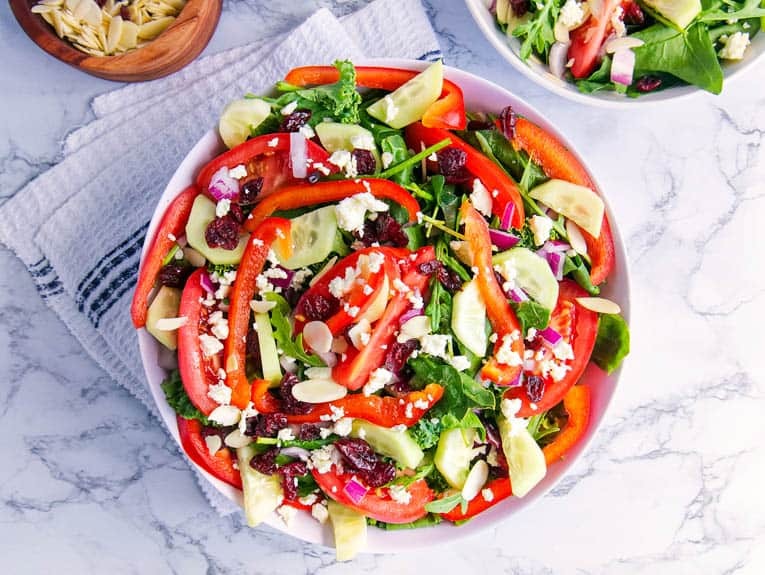 And you can load it up with any toppings you like: tomatoes, peppers, onions, spinach, kale, roasted potatoes, goat cheese, feta, artichoke hearts, fresh mozzarella, parmesan, butternut squash… I have to stop myself right now because I’m getting hungry just thinking about it. 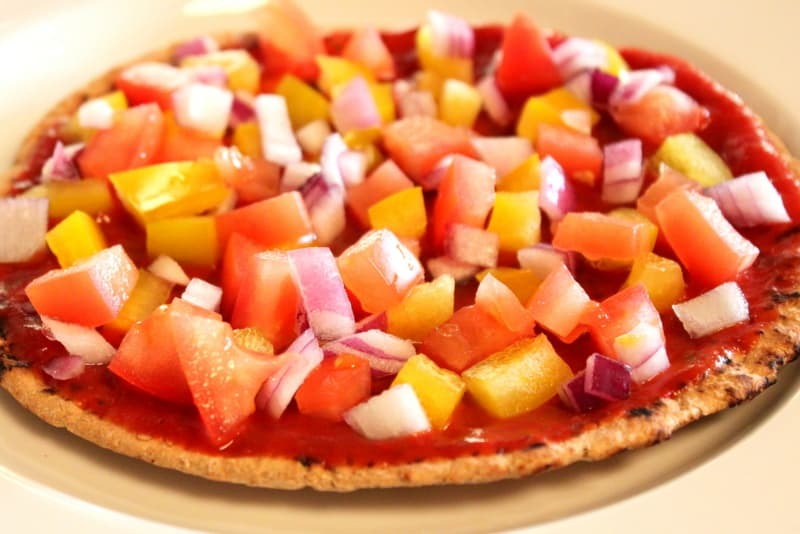 Step 2: Top 1 pita bread with 1-2 Tbsp sauce, and a handful of each of the veggies (use as much as you like – the more veggies, the more fiber and nutrients are on your pizza!) I like to use a ton of veggies. Step 4: Heat the pizzas in a toaster oven until the cheese melts. Alternatively, if you don’t have a toaster oven, you can heat the pizzas under a broiler at 350 degrees until the cheese melts (or in your regular oven at 350 degrees). 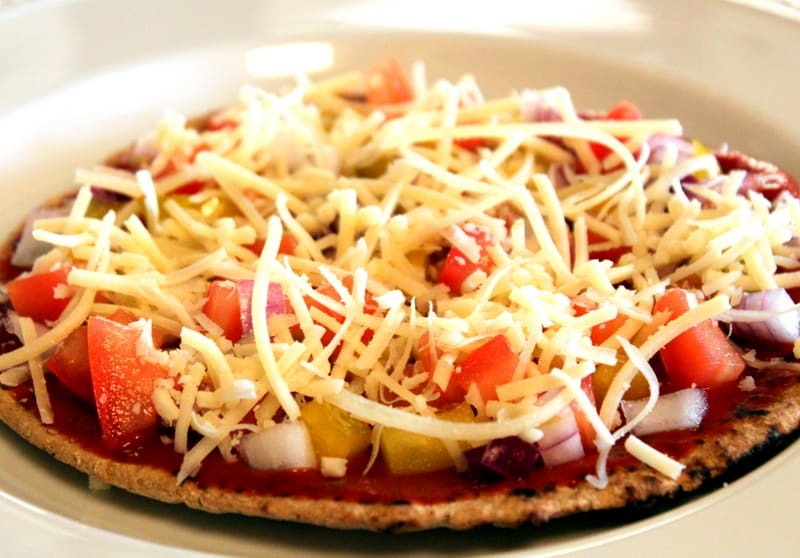 You definitely won’t feel deprived of pizza while eating this wonderful, cheesy, goodness. The husband was surprised as to how good it was. “I really like this!” was his reaction (almost in spite of himself). That was over two years ago, and we’ve been making this ever since. 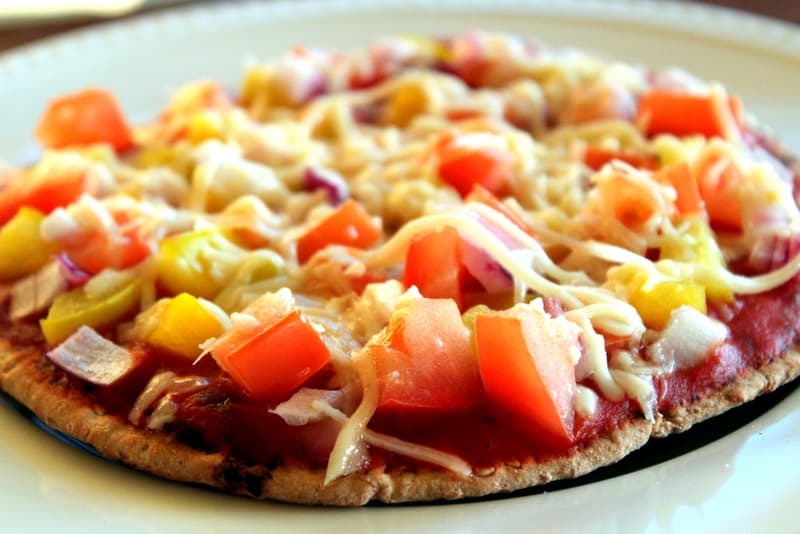 Using 1/4 cup of cheese, one pizza is about ~275 calories. 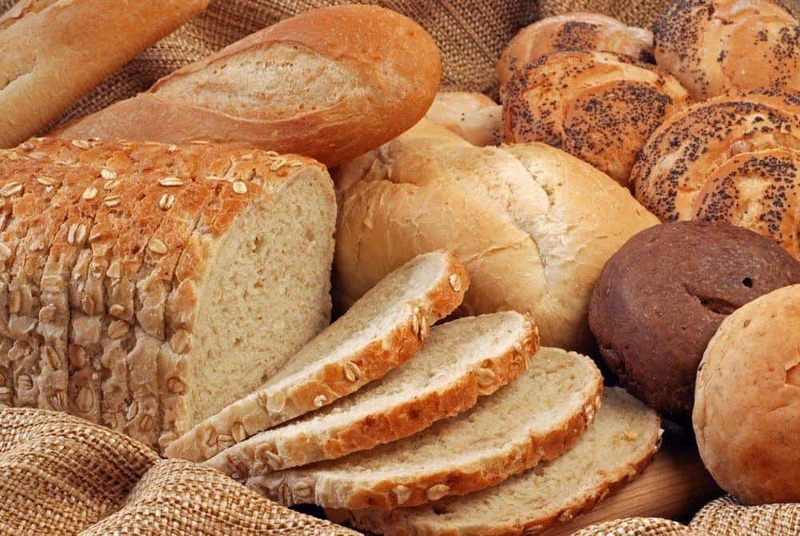 You’ll also end up with about 16g protein, and at least 6g fiber. And that’s for an ENTIRE pizza. Doesn’t that just make you want to devour this whole plate of deliciousness? Go ahead, take a bite. Awesome!! 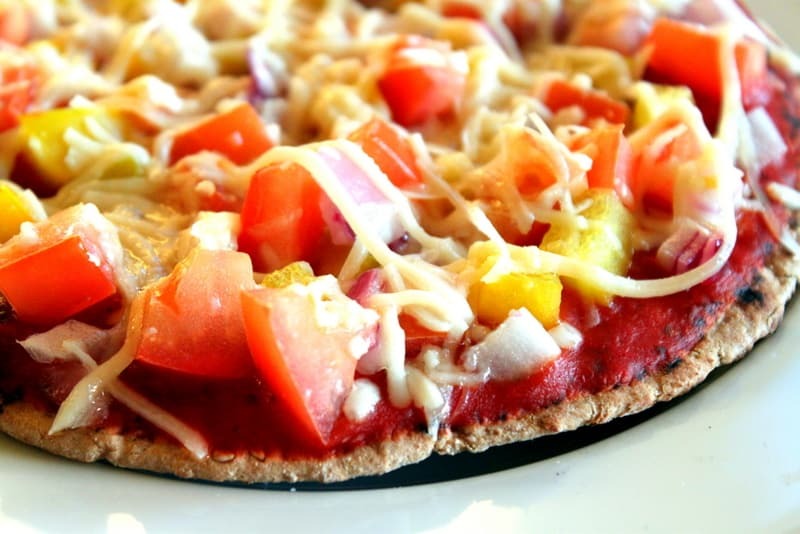 I’m sure you and your fiance will enjoy these pita pizzas! They are one of my favorite weeknight meals 🙂 Keep me posted on how they turn out! 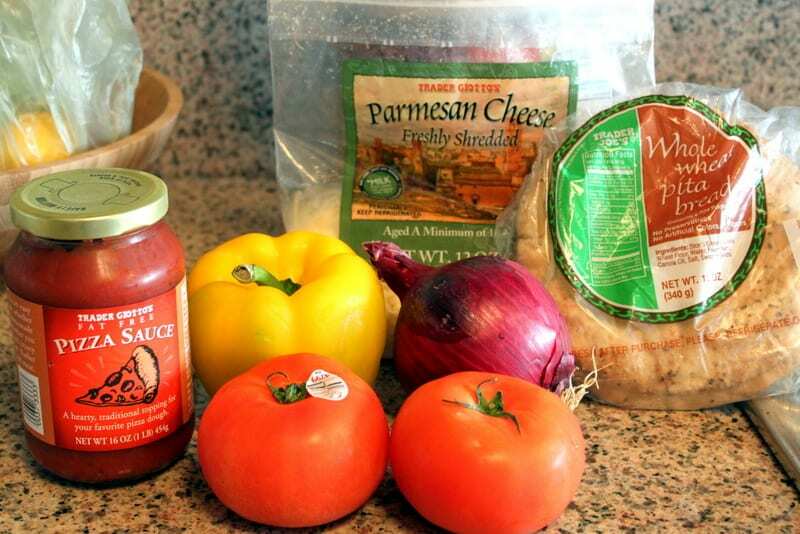 How is the Trader Joe’s pizza sauce in comparison to others? 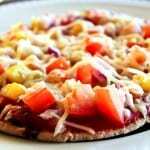 I have tried the typical pizza sauce brands and found them to be pretty bad. I want something that actually tastes tomato-y and fresh. Thanks in advance for the answer! Hi Judy! I actually love the Trader Joe’s pizza sauce — I think it’s one of the best (they have a freshly made one in the prepared foods section that’s even better than the jarred version). Hope that helps! Thank for sharing your yummy recipe. 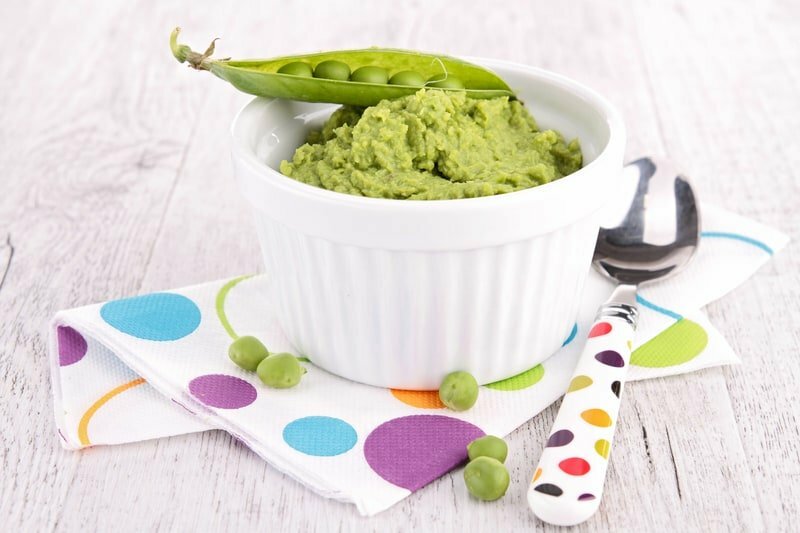 I love it and featured it in my round up “15 healthy recipes you can make with your toddler”. Feel free to come check it out and grab a button if you like ‘i was featured’ swag. Just tried this last night! My husband wanted to order take out pizza but I told him that we should try this instead. I made it and the first thing he said was “this is great!”. He ate the whole thing AND made a second one. Thank you!! Will add this to my weekly recipes. Woohoo!! That is so awesome – sounds like your husband is as big a fan of this recipe as my hubby is 🙂 So glad you both liked this recipe! Yaaay! Thanks Stephanie! I hope you loved these when you made them! That pizza looks great. 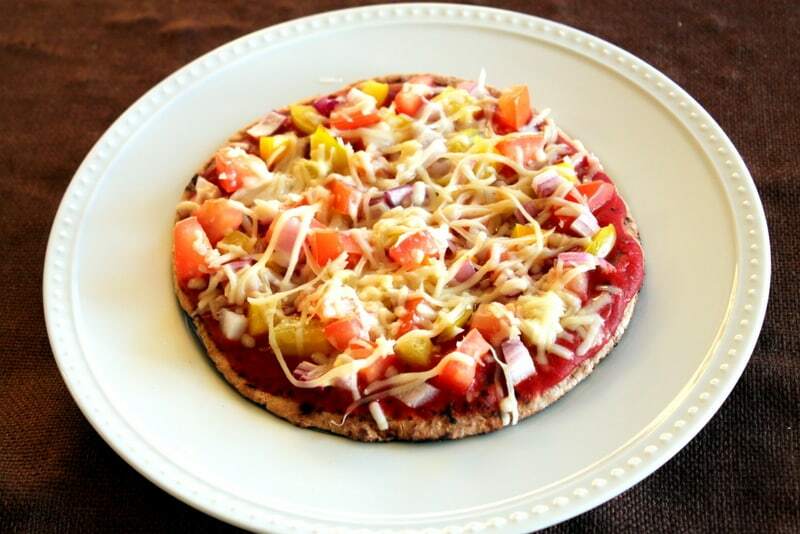 Children tend to like pizza and this is a good way to introduce healthy eating with something they enjoy. Absolutely! That’s the idea 🙂 And as Val mentioned above, you can get the kids involved when you make these fun pizzas as well! So pretty and colorful! 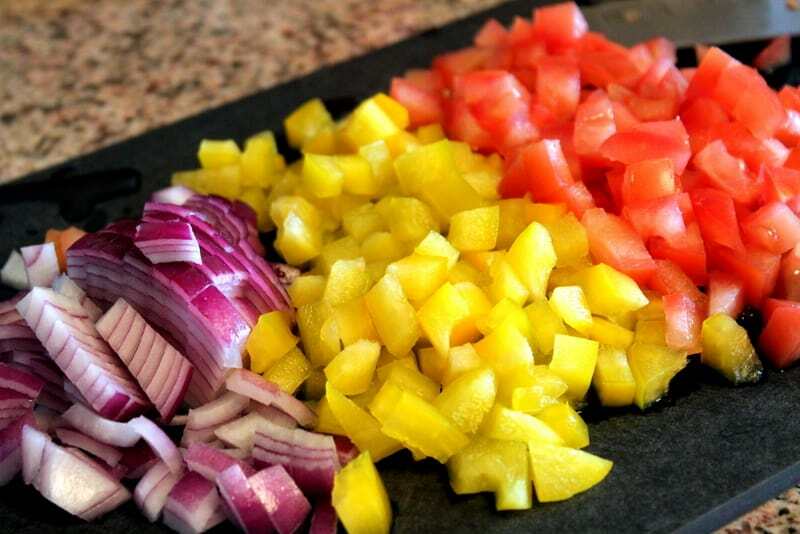 This is a great idea for a quick family dinner — each kid would get to pick their own toppings and then you can pop them all in the oven. Done and done. Also, I love Trader Joe’s whole wheat pizza dough but this seems so nice and easy to pull together. This looks so easy to make and delicious too! I’ll have to try it this weekend. Thanks so much!! I’m sure you will love it! Looks amazing…will add this to the menu for my wife’s bday dinner this weekend! Aw yay! I hope she loves it and I hope she has a great birthday weekend!